to give you the individualized and concentrated training experience Joseph Pilates used to improve his students' fitness for more than half a century. 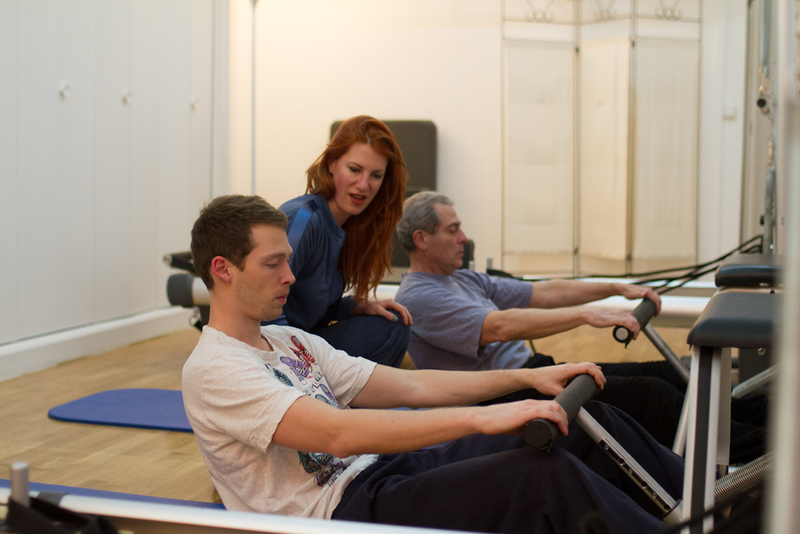 Pilates is not just good for your body, it's relaxing and fun too. Ladies duo creating lean muscle with Pilates Chairs. Pilates is challenging for our male clients too. Central location close to all transport and parking. We are located at 32 rue de Penthievre in the heart of the 8e arrondisement, just steps from rue du Faubourg Saint-Honoré, 6 minutes from the avenue Champs Élysées, and no more than 5 minutes walk from several Metro and Bus stops. We have paid street parking in front of our entry and on all connected streets, as well as garage parking 7 minutes walk away on avenue Franklin D Roosevelt. Comfortable, quiet studios bathed in natural light. Pilates Privé has private studio spaces on a quiet courtyard, with high ceilings and large yet private windows flooding its solid hardwood floors with natural light. Yet we only train from 1-3 people at a time to preserve your focus on Pilates and ours on you. There is a secure street entry to our comfortable waiting area - with bottled water, Nespresso, two private dressing spaces, lockers for your valuables, and two WCs. We are honored to be members of the Pilates Method Alliance (USA), et la Fédération des Professionels de la Méthode Pilates (France).